IN view of the forthcoming Air Ministry trials, to be held under the competition rules of the Royal Aero Club, for two-seater light 'planes the following particulars ДальшеMore>>> of a German low-power two-seater may be of interest. The following article is based partly upon descriptions published in the German journals Luftfahrt and Illustrierte Flug Woche, and partly upon photographs and material supplied direct to FLIGHT by Herr Dr. Ing. v Langsdorff of Riga, who was largely responsible for initiating the work which resulted in the construction of the L.15. Before proceeding to give a description of the actual machine it may be of interest to give a brief history of the steps by which the present light 'plane two-seater was evolved. Already as long ago as 1918 experiments were initiated by Regierungs-Baumeister Hans Klemm, who was at that time chief designer of the Daimler-Flugzeugbau, and who is now managing director of the Daimler works at Sindelfingen, near Stuttgart. 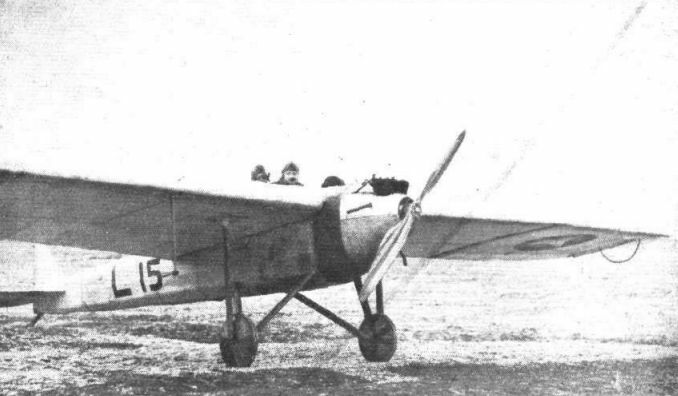 The 1918 experiments were made with a machine not suitable for gliding, the Daimler single-seater fighter, L.11, piloted by Eugen von Loessl, who later became famous in the Rhon, where, unfortunately he ultimately lost his life. The early experiments indicated the possibility of soaring in the currents blowing over the slopes of a range of hills, and sufficient was learnt to show that a machine specially designed for this sort of work should be able to soar for considerable periods, and make glides of several miles. In 1919 a monoplane glider with low-power engine was constructed at the Daimler Carriage Works, to the designs of Herr Klemm. Unfortunately the machine was damaged while testing a new propeller, and the experiments had to be discontinued, mainly owing to the difficult financial conditions obtaining at the time. It was not until 1922 that work on the machine could be resumed. The old wings and fuselage of the 1919 machine were overhauled and reconditioned, but the machine was changed from a light 'plane to a pure glider. On this machine several glides were made by Herr Dipl. Ing. Martin Schrenk, first over a low hill near the Daimler works, and later in Schwabischen Alb, where the conditions were much better, although not comparable with those obtaining in the Rhon. Glides of 13 minutes' duration were made, and distances of 4 kilometres (2 1/2 miles), with a loss in height of only 250 metres (820 ft.), were covered with this machine. The gliding experiments showed the machine to be a good glider, efficient aerodynamically and possessing ample controllability. The next step was the conversion into a light 'plane, which resulted in the production of the type L.15 to which the following notes refer. In this connection it is of interest to note that the idea of the dual purpose of light 'plane and glider has been retained, the machine being capable of being converted from one into the other very rapidly. Incidentally it may be mentioned that in one form the machine was built as a low-wing monoplane, somewhat resembling the de Havilland 53. The present machine, however, is an ordinary monoplane. The Daimler L.15 has a fuselage of ordinary construction, with four longerons and formers and wire bracing. In section the main structure is rectangular, but fairings are added at top and bottom to give better streamlining. The covering is fabric doped in the usual way. The cantilever monoplane wing is of ordinary construction in that it is built up over two box spars. It is, however, built in three sections for ease of transport, the two end sections being attached to the centre section by quick-release devices. Lateral control is unusual in that, in addition to the usual ailerons, pivoted wing tips are employed. We believe that as a matter of fact the original glider had those wing tips only for lateral control, and that the ailerons were added when the engine was installed. The undercarriage is of the type found on torpedo 'planes, i.e., there is no axle connecting the two wheels, each of which is supported on a pyramid of three tubes, two of which run, in Vee formation, to the fuselage longerons, the third being taken to a point inside the centre-section of the wing. Shock-absorbers are housed inside the wing, no springing being provided at the bottom of the chassis struts. The wheels are of a type similar to those used by Mr. Shackleton on the A.N.E.C. monoplanes at Lympne last year, consisting of laminated ash rims with three-ply discs. On tests one of the Daimler wheels withstood without breaking a load of 600 kg. (1,320 lbs. ), although its weight was but 1-2 kg. (2-64 lbs.). This form of undercarriage was chosen by Herr Klemm partly because he believes that a wheel axle raised but a few inches above the ground is likely to throw a machine on to its nose in long grass, and partly because the travel of the wheels can be made more than the radius of the wheel, as in the ordinary Vee-type chassis. Also the shock-absorbers can be totally enclosed in the wing. The objections to it are, of course, fairly obvious. A hard landing may strain the wing structure, which may consequently fail on a subsequent flight. When the centre-section of the wing is removed, the undercarriage has to be braced to stabilise it. This is done by three cables, one running from one wheel to the other, and one on each side running to a point on the fuselage. This bracing is sufficient for light loads only, of course, such as for trailing the machine behind a motor-car. The engine fitted in the L.15 is a motor-cycle engine of 7-9 rated horse-power. It is stated that at the speed at which it is run in the machine the actual power developed does not exceed 12 b.h.p. The engine is an air-cooled Vee-twin, mounted on a steel structure in the nose of the fuselage and cowled in all but the top of the cylinders. A planet reduction gear has been added to obtain better propeller efficiency. The petrol tank is carried behind the engine, and direct gravity feed is used. Mention has been made of the fact that the L.15 is convertible from light 'plane into glider and vice versa. This is accomplished by building up the nose of the fuselage as a separate unit. The "glider nose" contains a cockpit and the usual controls, so that by adding a short length to the control cables the machine can be controlled from this cockpit, while, if desired, a passenger can be carried in the cockpit between the wing spars. Incidentally, the controls then allow of the machine being used for school work (dual). 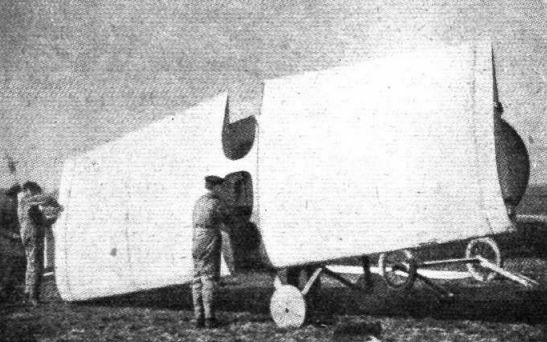 For use as a light 'plane the ''glider nose'' is removed and the nose containing the engine and tank substituted. The fastenings used for securing the noses are of a type requiring no adjustment and no special tools. When the machine is used as a light 'plane two-seater the passenger sits immediately behind the pilot, in a cut-out in the trailing edge and just behind the rear spar. It would appear likely that with this arrangement the centre of gravity might be rather far aft, as the combined weight of pilot and passenger would, it would seem, be likely to more than make up for the weight of the engine farther forward. But few particulars are available relating to the characteristics of the L.15. The wing span is stated to be 12-6 metres (41 ft. 4 ins.). The engine, as already stated, develops about 12 b.h.p. at the speed at which it is run. Already several very good performances have been put up by Herr Schrenk. Thus during a solo flight he reached an altitude of 2,150 m. (7,050 ft.). With passenger the machine has climbed to 1,100 m. (3,600 ft.). During a solo flight the machine remained up for 3 hours 5 mins., and while carrying a passenger a duration of 2 hours 2 mins. was attained. The longest non-stop cross-countrv flight made solo was 190 km. (118 miles), and one flight of 120 km. (75\ miles) was made with a passenger. In view of the low engine power, these performances are highly creditable, more especially so when it is remembered that the machine was virtually designed four years ago, i.e., before the Rhon competitions had really shown the way to the efficient glider and light 'plane. View of the Daimler L.15, showing engine housing, undercarriage, etc. The pilot is Herr Schrenk, with the designer, Herr Klemm, as passenger. 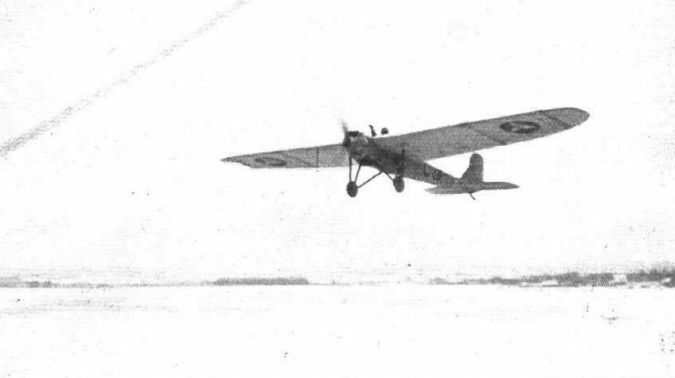 The Daimler L.15 in flight over snow-covered aerodrome. 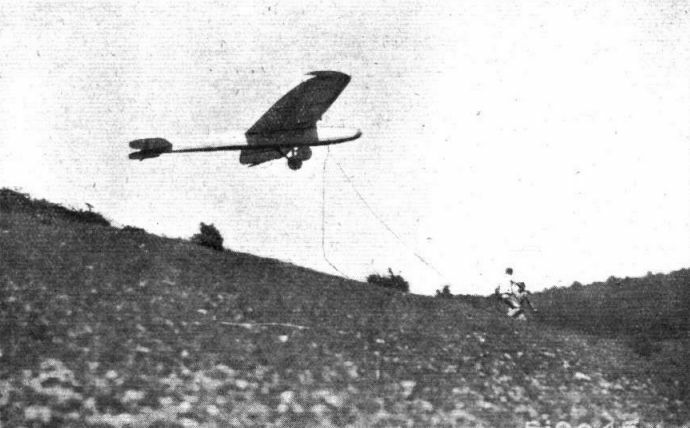 The Daimler L.15 being launched as a glider. THE DAIMLER L.15: On the left a sketch showing the folding tail, and on the right a view of the detachable "nose" of the fuselage.